A quick note to let you know that the racks arrived safe and well through TNT this morning. They are superbly packaged and have made the journey in perfect condition. I think they are going to look brilliant. I will be touching base with your suggested installer today. Hi, bought a wine rack off you the other day. Very happy with it and service! Could you supply a quote for another 3 the same please with delivery to same address. Metal wine racks installed and will do top for bench tomorrow. It’s just so refreshing to be dealing with people that respond in a timely manner and keep the process simple. were well cared for in their wooden crate and look great in my cellar. 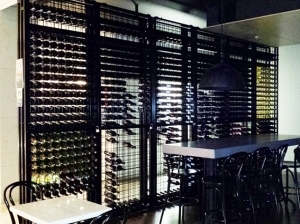 Wine racks received yesterday and installed and filled last night. Thank you, I love how prompt you are with your Service, very much appreciated. Yes I can definitely organise a photo once it is in place. Hi guys just got our wine racks and they are awesome. I would like to order 200 clips please. Give me a call and I can give you address details and pay. Cheers! Steve, just spent an hour installing the recently delivered racks. Easy job. Everything went together smoothly and simply. Impressed! Steve, just wanted to say thanks for the quick turnaround on the wine racks. Arrived last week and installed over the weekend and look very good, friends are most impressed. Really happy with the wine racks which I installed over the weekend. Thanks again for a great product at an affordable price. The wine racks have arrived. We have installed them and they look great. Thanks for your fabulous service. The rack arrived safely and looks great. Thanks for your help will be looking to get some more racks soon. I'll send you a picture once it's exactly in place and filled. Delighted with the racks. They look great. Just to let you know its now all installed, it worked and fits perfectly and looks super awesome! Thank you for all your help and patience, it's VERY much appreciated!